Local people arguing for a Cambridge Congestion Charge and the hundreds of millions of pounds of up-front government money it would bring for transport. The proposals include the creation of massively increased levels of cycling all around Cambridge. With this funding, the era of bikes left insecurely against a wall could end. Cycle parking is an essential tool in encouraging cycle use, reducing pavement obstructions and fighting the scourge of cycle theft. 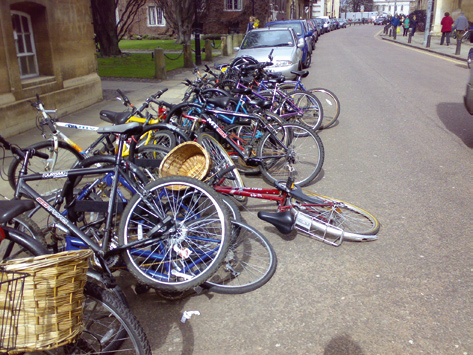 Cambridge is currently the worst UK city for bike theft outside London, according to a Halifax Insurance survey. In one car parking space, you can supply sufficient bike parking to solve the needs of ten people, as ten cycles can be parked in the space required to park one car. This has to be a better use of our limited parking areas. 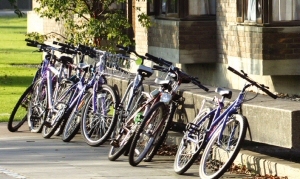 Cycle parking is easy to use and if people know they will have a secure, easily accessible place to lock a bicycle wherever they go then it will provide them with an incentive to give their car a miss and use a bike instead. Cycle parking is needed all around Cambridge, not just the city centre (where space constraints are more problematic). With the scale of funding that the Congestion Charge and up-front hundreds of millions would provide, there is at last the chance to get a proper city-wide initiative, backed up by time from Council officials, to get city-wide cycle parking. Local streets, shops, and major destinations could all be upgraded. 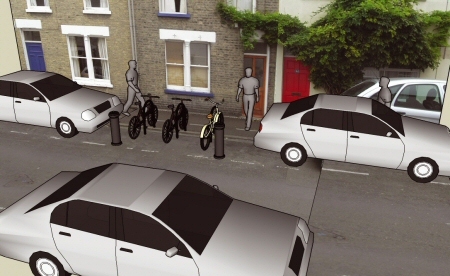 Cambridge Cycling Campaign’s website has many articles on cycle parking issues, and there is a section on it in ‘Cycling 2020′.